I was struck recently in visiting the Japanese collection at the National Gallery of Victoria by the forms of the Shigaraki jars. The rough and dynamic designs dating from the 16th century in the Muromachi period (1334-1573) were used in the complex aesthetics of the tea ceremony for the beauty in their 'natural imperfection' (Jap. - wabi) and their commonplace and humble origins. The fashion of the day eventually led to innovation in glazing techniques being adopted in the regions of the Six Ancient Kilns, which sought to copy higher quality aesthetics from China of the same period (Kidder, 1981). 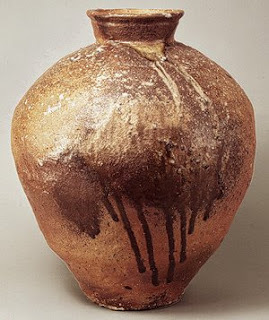 It is ironic that the simplicity of these practical vessels created their later attractiveness. In this we find the beauty of poverty, where the simple and naturally flawed holds a nostalgia of exquisiteness for us. We each probably have an object of beauty that holds an attraction for us, even though its aesthetic appeal is lacking to other tastes. The beauty is in the meaning, not the contents, these objects skilfully hold. Perhaps it is the new muddy footprint on the floor of the most perfect architect designed family home that gives the clean space its 'now it is truly finished' appeal.